I was ready Patchwork Times, one of my daily reads, because Judy just makes me laugh. She had a linky box for the monochromatic challenge, and one of the quilts pictured just blew me away! Check out the new flimsy by Amy at Flimsy Excuses. I absolutely have to make this quilt. I was sure at several points in time that this quilt would get the best of me. I powered through though, slow and steady until the last stitch was sewn. 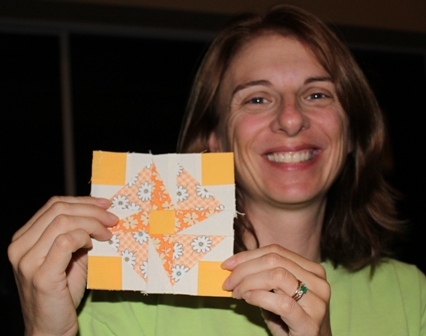 I didn't even skip the intricate pieced border, though I was sorely tempted. The plan was to put away the sewing at 4 and start grading free response essays from Fridays test, but I was too close to the end to give up. As far as quilting, the plan is to save up several larger sized tops that are in various stages of completion so that the frame can be extended out to its full length temporarily. I usually only keep it at a twin/full size so that it will fit in the study better. I think it will still fit in the room even though it will be hard to walk around. 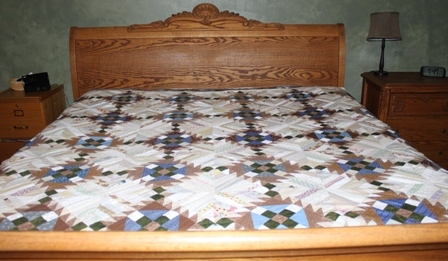 If not, I'll bring it out into the formal living/dining room for a weekend marathon of quilting. For now though, I guess I'd better get started on those essays. Mom: Let's all go out for breakfast this morning as a family. Today we are all puttering around the house. Kurt is shopping online for new cars while watching football. Anna found some scrapbooking supplies to do crafts. This morning we went out and got a haircut, she wanted bangs. Ryan is working on Lego Robotics. Tonight he is sleeping over with his friends. Sydney is missing in action, she keeps calling to tell us who's house she is at. Last phone call was asking if she could have friends sleep over here. I have Netflix going on my i-pad while working on the RRCB border. They just need ironing, I'm sewing them together as I go. It is the last Saturday in September and I am liking the black background for crumb blocks. I whipped these little geese blocks up last weekend. Today I am going to try out some stars and hearts from the Crumb along tutorial on Tuesday. What scraphappiness are you up to today? Use the linky below to share your progress. I am trying hard to do one block every Tuesday at the very least to stay caught up with the Midget Sampler Quilt. Like anything else, its all about getting into the habit. This one is called Arabic Lattice. 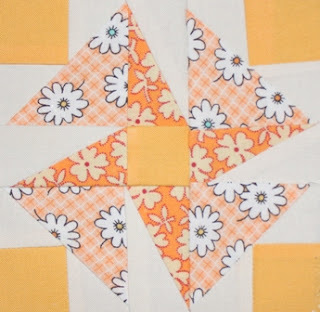 Whenever I looked ahead through the blocks I dreaded doing this one because it looked ugly and awkward and the pattern asked for templates and hand piecing. Of course, like anything else, once I actually started working on it, it wasn't as bad as all the anticipation. 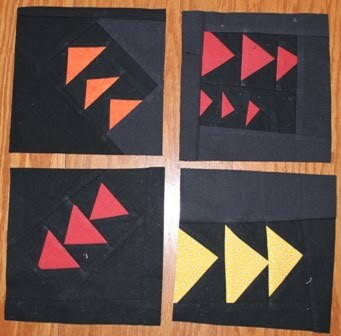 The middle of each square is a four patch with one inch squares. 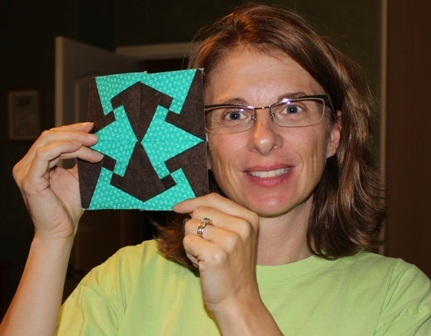 I cut out freezer paper templates for the triangle sections and then used a partial seam on the machine. So simple in the end. I still think it is an ugly block, but at least it is a finished ugly block. On a much prettier topic, check out the fabric that I picked up last time I was in Atlanta to see Mom! She took me to a quilt shop called A Scarlet Thread. It was a HUGE quilt shop with a great selection of reproduction fabrics. My favorites are the little hedgehogs on the end. I don't think it is proper depression era fabric, but I had to have it anyway. The school weeks have been nonstop hectic, things are in full swing academically and evenings have been scattered with training sessions and such. Last night was the first Academic Team match and that was a lot of fun. Our team was the most enthusiastic and had the most members. I'm still getting to know every bodies strengths, but they seem like a great group of kids. Sydney wanted to go with me to the Eduquilters meeting yesterday. There was going to be a trunk show by an art quilter followed by a chance to work on the comfort quilts for QAKH (quilters against kids hunger) in the afternoon. Sydney had Girl Scouts first, but Kurt brought her to the meeting when she was done. She was really enjoying the trunk show, commenting on each of the pieces and having lots of fun. 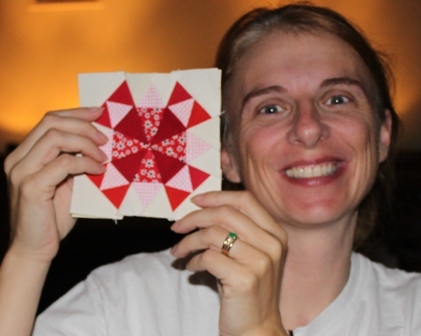 Then when the quilting started, she was having a blast. She kept telling me how much fun she was having. This is the first quilt she made, I tried to help, but she kept telling me she wanted to do it all by herself. She lost interest about halfway through the second quilt, so I helped her finish that one up before we called it a day. 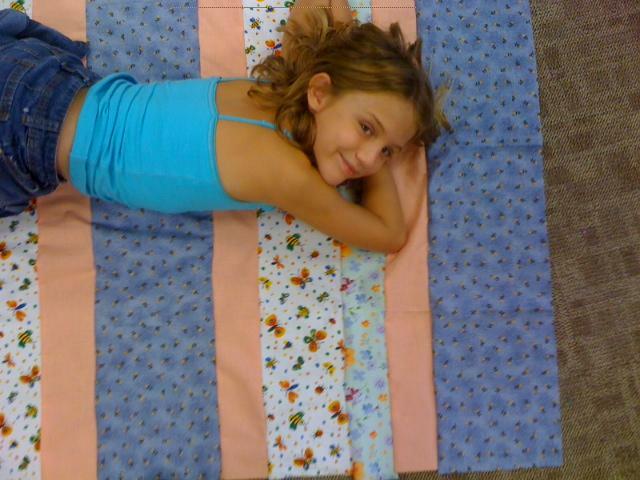 It makes me so happy that Sydney is enjoying quilting so much. I've already started working on the next generation of quilters. This morning I got up bright and early to finish sewing the RRCB blocks together. Now it just needs borders and backing and eventually binding. Why do those blasted B's always get me bogged down? Glad I can leave out the basting part though, that does help with getting to the end of the process. 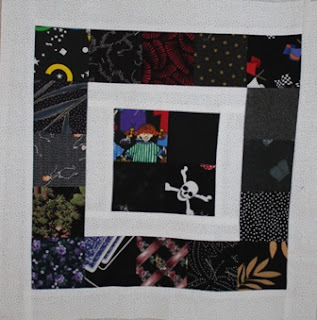 I've always loved the look of Amish quilts, especially those with a black background. Never having done the whole black quilt thing, I thought this month would be a good time to play a little with the concept. What a fun way to use up all the triangle bits leftover from joining strips of binding fabric! It doesn't take much effort to turn them into little geese. 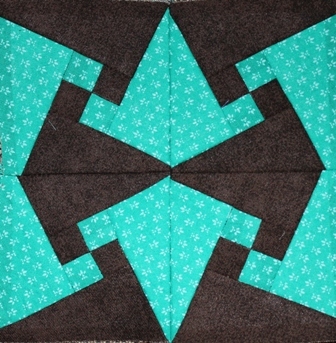 I've got a quilt group thing to go to this morning, but I'd love to try some crumby Chinese coin blocks this afternoon. I can already see it in my head. Head over to Jo's Country Junction to look at all the other crumb creations, or follow the links below to see what people are cooking up for the Rainbow Scrap Challenge. Happy Saturday. I am in the mood to make some flying geese crumb blocks with black backgrounds today, how about you? Block number 47 is called Crazy Ann. I'm not sure why. 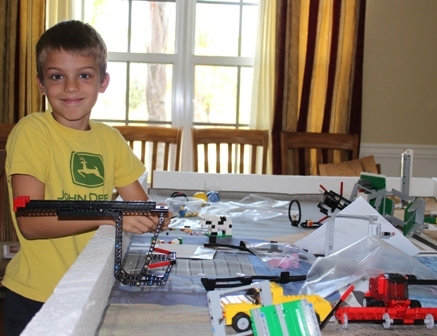 It is foundation pieced in 5 sections and has 25 pieces. For the most part it went together as it should, though I tried to reverse one of the little skinny triangles and had to redo it, that's why the points are off on one side, but I think taking it out again only would have made things worse. Yesterday was an inservice day so today was one of those Tuesdays that felt like a Monday all day. I've got the last of the evening training session tomorrow, so I need to try to get a little bit ahead tonight. 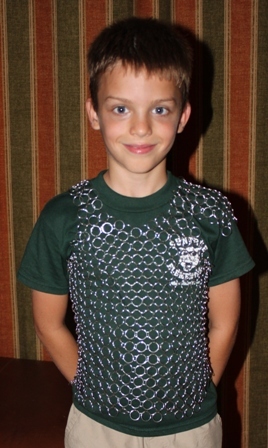 Kurt has been working on chain mail for Ryan to wear for Halloween. He is using really big rings, but it is still a laborious process. Ryan is pretty happy with how it is turning out though. So I decided that I finally needed to get started on finishing up Roll Roll Cotton Boll. I think I'll call this version Rolling Right Along. I had to make a few changes due to general distract-ability during the extended construction process. First I put the churn dash blocks together with a different color arrangement because I thought I remembered the directions that way. Once I got started that way I decided I liked it enough to keep in inside out. Then when I put the string blocks together I got carried away and turned them all into squares instead of keeping some out for the setting triangles. So I cut those apart and added another strip of fabric to the edges to stabilize the bias and make sure the triangles were big enough. I think it gives it a border like feel. 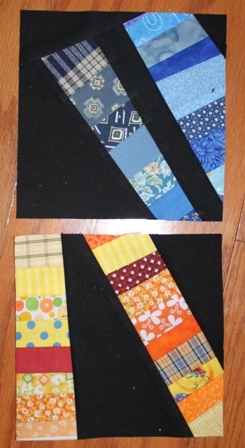 I did finally find the pieces for the real border, though I don't think I'll work on that right away. 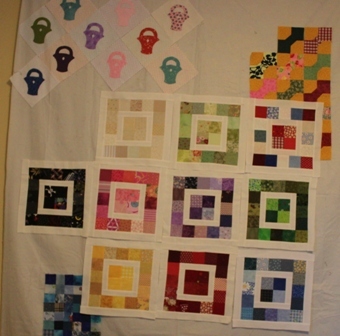 If I can get the blocks sewn together I will hang it all up and have it ready to go next time I am in a border mood. Most of the kids ended up having sleepovers last night though Kurt and I had already arranged for a babysitter. I had to call and cancel when two of the three were gone for the night. This morning the girls went to the beach while Ryan was fishing with a friend. They have the day off school tomorrow while I'm off at in-service meetings. This afternoon I went out and got a haircut and some highlights, other than that I've had a nice quiet weekend of puttering around the house. I guess it is time to get some lesson plans and grading done so that I am ready for the week when it starts on Tuesday. 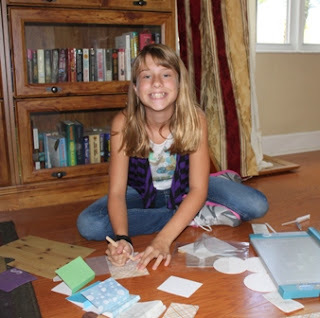 Use the linky box below to post your Scraphappy Saturday progress. I think today will be and odds and ends day. There is a Girl Scout 5K, but neither of the girls wanted to go. Next weekend there is a quilt group thing, but for today, not much is going on. I think I'll take the ScrapHappy blocks down and start putting up the blocks for RRCB. They are getting close to done, I just need to find all the HST units that have gotten scattered and lost along the way. There is a nice stack of fabric from the Goodwill shirts, that would be fun to play with. I guess I'll start by catching up on ironing and sorting and see what bubbles to the top of the priority list. Actually it was a very nice Friday, but I pulled out the crumbs this evening to get ready for the Crumb Along over at Jo's Country Junction. I seem to have a baggie of string and crumb blocks already in the works. I'm not sure, but it looks like there are 20 or 30 finished blocks in there. I liked the consistent use a a red solid that Jo had in her crumb quilt, so I pulled a chunk of red out of the stash as well. 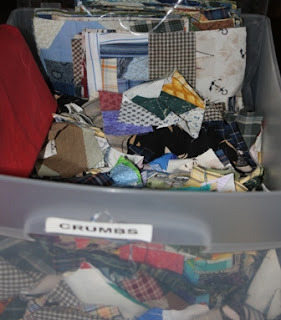 While I was playing with scraps, I pulled out a stack of shirts that I picked up at Goodwill a couple of weeks ago. I just love the clearance room. 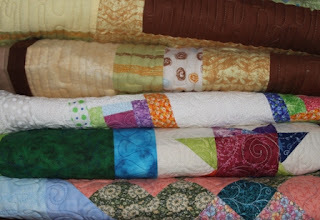 How can you beat quilt fabric for $0.95 per pound? It's been a busy week at work again, but the weekend looks wide open. 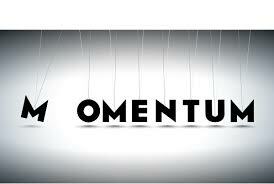 If I were smart I would spend some time getting ahead of the game so next week will be more relaxed. I wonder if I'll be smart? For now I've got a pair of scissors and a stack of shirts, I'll think about work later. Even though I was out of town for the weekend, and have lots of catching up that I should be doing, I wanted to take time today to celebrate Tiny Tuesday. This is Midget Block number 46 and it is called Dancing Star. It has 36 pieces and was paper pieced in 8 sections. I tried to use a charm square for the red, but didn't have quite enough from one piece. If you look closely you can see that there are two colors of red. I'll pretend that I did it on purpose. It amazes me every time how much fabric gets used up in paper piecing. 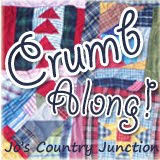 Have you seen the new button up in the left hand corner for the Crumb Along and Jo's Country Junction? Today is the first day so there is plenty of time to join in. 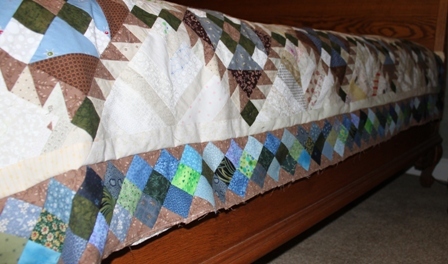 A crumb quilt along seems to go nicely with the Rainbow Scrap Challenge. Maybe I can work the color of the month into my crumbs and make it all work together somehow? In any case, I love playing with crumbs and joining in with other people will make it more fun. I'm a bit worried that people will not enjoy working with black. I can't imagine an entire quilt full of just black. As a background color though, for a collection of bright colored scraps, I think it sparkles. 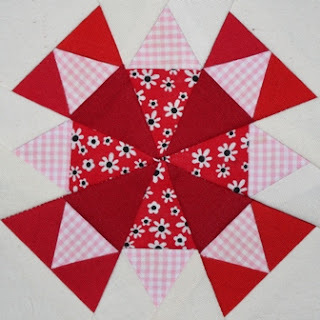 I've seen lots of great quilts with black and white showing off a splash of bright red or hot pink or lime green. If it still doesn't speak to you, think of black as a full range from morning dusk to charcoal and ending with midnight. As for me, I'm going to try to empty out the jar of "dark" and add another block to my Scrapphappy square collection. Maybe I'll throw in some orange and purple to get a head start of Halloween? I guess time will tell. Most people have figured out that the new color this month is black. I was thinking that fall colors were on the horizon already, but I forgot that black and white needed to be in there somewhere. 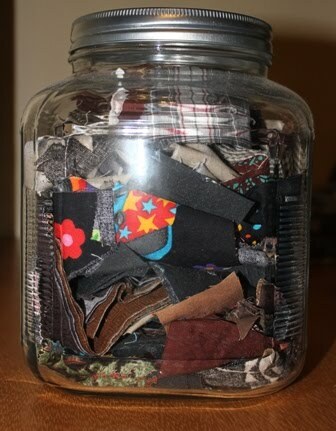 My "dark" jar isn't overly full, but I might play with dark backgrounds if there is time. I'll have to pull the browns out and set them aside first, it isn't quite time for those. Guess What I'm doing in the Car? My husband, always quick to offer an opinion, accused me of cheating by calling these quilts done before the binding was sewn down. I explained quite rationally, that I was saving the binding. This stack of quilts looks like the perfect way to stay busy on a nice long car trip.